HTC has announced the latest member of their Desire family at IFA 2014 in Berlin. 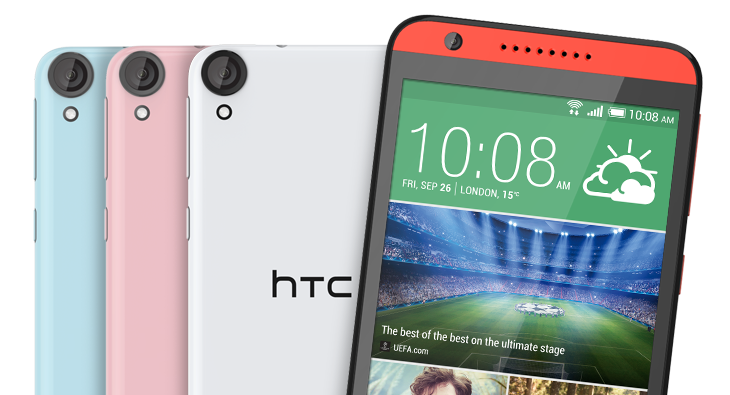 The new HTC Desire 820 is the successor to the popular Desire 816 and is the second HTC phone to have a 64-bit processor. The Desire 820 is the first phone to run on the new Qualcomm Snapdragon 615 (MSM8939), which has an octa-core CPU with eight Cortex-A53 cores, four of them clocked at 1.5GHz and four at 1.0GHz, along with Adreno 405 GPU. The SoC is based on the 64-bit architecture and HTC will update the phone to Android L, which is designed to take advantage of 64-bit processing. The Desire 820 also has a 5.5-inch, 1280x720px display, 13 megapixel rear camera, 8 megapixel front camera, and BoomSound speakers. The phone will offer Cat 4 LTE connectivity. The HTC Desire 820 will be available the end of September and select markets will get a dual-SIM version. The available colors are Marble White, Tuxedo Grey, Santorini White, Milky-way Grey, Tangerine White, Saffron Grey, Flamingo Grey, Blue Mist, and Monarch Orange.